The nomination papers filed by Chinju Ashwathi, an Independent candidate contesting from the Ernakulam Lok Sabha constituency before the District Collector on Thursday, mentions the queer, Ambedkarite activist’s name as Ashwathi Rajappan. “I am one of those persons who has to live with a name they are not happy with and carry an identity card they do not like. My identity card states that I am female, but I am intersex and transgender,” says Chinju on Friday. This is one of the issues, among others, faced by various marginalised communities that Chinju will raise during the electoral campaign. With Chinju’s nomination being accepted by the returning officer, the activist’s supporters kick-started the online poll campaign on Friday by launching a Facebook page. According to the page, Chinju is the first openly intersex individual to contest the Lok Sabha elections in the country. The public campaign will begin on Monday, says Chinju, adding that meetings will be organised in ten selected areas in the constituency in addition to direct interaction with the public. The poll manifesto, soon to be released, will focus on issues faced by sexual minorities, Dalits, workers in the unorganised sector, fish workers, and also on Ernakulam’s drinking water problems. “I am not new to Ernakulam. I have lived here and know the problems faced by the people here. I am just another commoner,” says the 25-year-old electronics graduate from Angamaly, adding that the queer community is not any different from the rest. “We are just like all of you,” says Chinju. The activist has been at the forefront of queer campaigns in the State, and has presented a paper before the Parliamentary Standing Committee discussing the Transgender Persons (Protection of Rights) Bill in 2015. “But, it was far from a pleasant experience,” says Chinju, adding that transgenders, even in administrative parlance, are described as “neither male nor female”. “I am someone who lived as a woman for 22 years,” says the activist, who came out as an intersex individual in 2016. But unlike several other LGBTQI individuals, Chinju found acceptance and support at home. 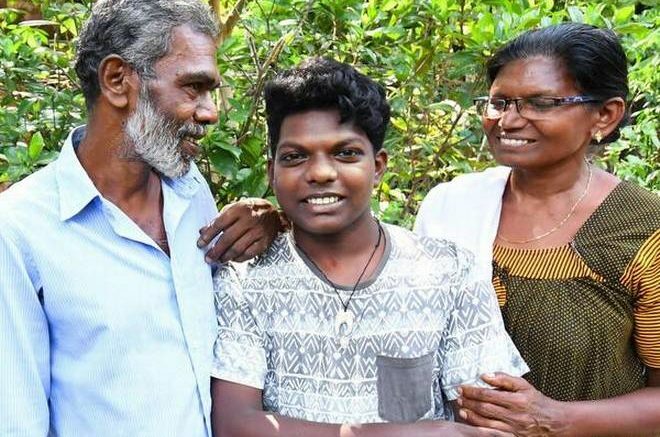 “My parents were workers of the Indian Dalit Foundation and I grew up around discussions of Dalit politics.” With the Kerala government introducing a transgender policy and launching several support schemes for the group, transgenders have found some acceptance in society. But intersex individuals are still stigmatised, and they continue to live in shame, says Chinju, who has worked with several such persons across the State. What the activists want is an equal, democratic space for persons of all genders, and a platform with enough room for an open discussion on such topics. Chinju hopes that the poll campaign, irrespective of its results, will bring visibility to the queer community. In Ernakulam, Chinju will take on heavyweights such as Hibi Eden of the Congress, P. Rajeev of the CPI(M), and K.J. Alphons of the BJP, but the activist remains unperturbed. Follow Chinju Aswathi Rajappan’s campaign page here. Be the first to comment on "Queer Ambedkarite Chinju Aswathy from Kerala to contest Lok Sabha polls"